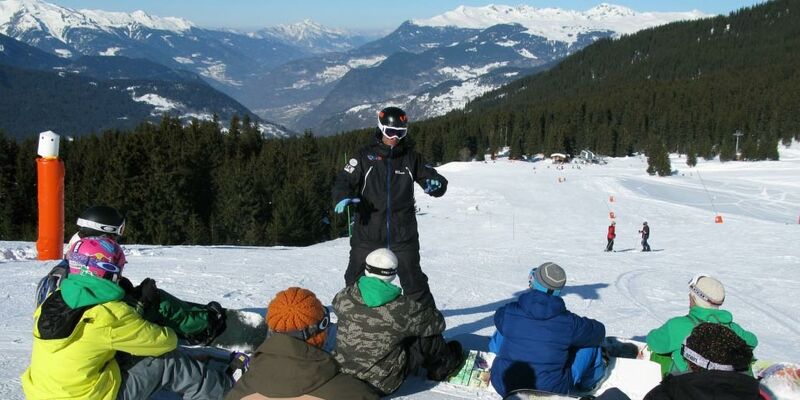 Here at Pleisure Holidays we have teamed up with the best British snowboard school in Courchevel (RTM) to bring you the finest snowboard instruction in Courchevel. Here at Pleisure Holidays we have teamed up with the best British snowboard school in Courchevel (RTM) to bring you the finest snowboard lessons in Three Valleys. Better understand the techniques involved in snowboarding whilst improving your own style and perfecting your technique so that you can really make the most of your snowboard holiday. The qualified and dedicated British instructors work with snowboarders of all levels from beginner to expert, and can also offer freestyle coaching and off-piste guiding. Don’t just ‘huck’ it and hope for the best, get some professional coaching and watch as your riding improves; from one-hour improver sessions to week long courses, we can tailor a snowboard instruction package for you and your group. Please get in touch for more details and prices. If you’ve never snowboarded before, now is the time to learn. With the crisp mountain air and breathtaking Alpine views as your backdrop, learning to snowboard in Courchevel is something which will stay in your heart and soul for years to come. There’s simply nothing like it. Let Pleisure Snowboarding Holidays provide the accommodation, transfers, great food and wines, snowboard equipment and lift passes, whilst our partners at RTM (one of the best snowboard schools in the business) offer their professional snowboard lessons and coaching to our guests.